A month ago, one of these islands didn't exist. On December 13, fishermen in the Red Sea reported volcanic eruptions shooting lava into the air. 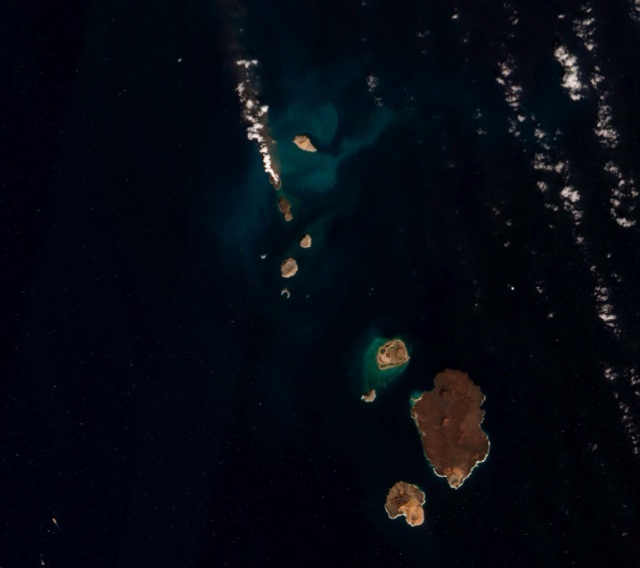 Just ten days later, the new island was visible. Volcanic island formation is one of those natural phenomena that most of us have known about since grade school. And yet, it never becomes not awesome. Smithsonian has a Q&A with volcanologists (still one of the most awesome jobs), that explains some of what's going on. Even if you already know the general basics, the specifics of this particular island are pretty neat. The “new” volcano, of which you can see the very top, has probably been erupting episodically underwater for thousands of years. While its above-surface dimensions are roughly 1,739 feet east-to-west and 2,329 feet north-to-south we know the larger submerged shield it sits on is about 12.5 miles across—an edifice whose age is unknown, but the Red Sea may have begun spreading apart about 34 million years ago and the shield volcano could thus be tens of millions of years in the making. Keep in mind that this whole region has had many volcanic eruptions in the last five years. In 2007, for example, a sudden eruption on the nearby Island Jebel at Tair killed a number of soldiers stationed there. The process of plate tectonics seems to be going on a little faster, at a quickened rate in this area. Why? We don’t know. The general public needs to be reminded that volcanologists are often in the dark about these processes.